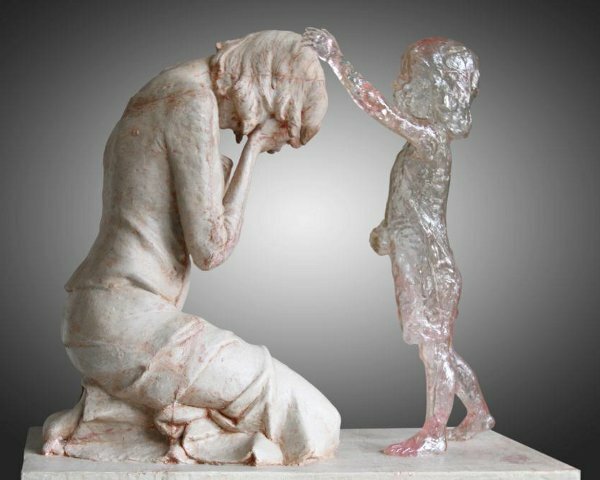 Young Slovakian Sculptor Captures Post-Abortion Pain, Mercy and Forgiveness — 1389 Blog - Counterjihad! As an art student, Martin Hudáček of Slovakia was moved to create a sculpture to draw attention to the devastation abortion can bring to the woman, and that through the Love and Mercy of God, reconciliation and healing are possible. Praised by many as an extremely effective representation of post-abortion trauma, the work sensitively communicates this reality, and draws out many emotions and interpretations. Para las personas que están sufriendo después del aborto, hay esperanza y ayuda. Beautiful sculpture and I am ‘stealing’ this post. This has tremendously personal, deep feelings for me that are sort of explained in my post as best I can convey them. Deeply, deeply personal and we are never to old for healing and forgiveness! My apologies for not not posting any feeds up as I am just now into my 5th week of recovering from that spinal fusion surgery I told you about. I am starting to get me feet back under me but I still VERY restricted on what I can do for at least another three to four weeks. Recovery has gone much slower than either me of surgeon expected. Was on the table for 5 hours and could have used two to three more but five was almost too much. Anyway, will see if i cannot get a feed or two up here in the next few weeks. Hope all is going OK with you and yours.